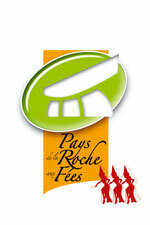 Tourism in Ille and Viliane, Upper Brittany, strives to improve its excellency. Their goal is to encourage and promote the quality of services provided within the Tourist sector, as well as constantly looking for ways in which to better meet the expectations of our visitors. With this in mind, the Ille and Viliane Tourist Board has set up a competition “The Tourism Trophy”, which creates healthy competition within the tourism sector and also helps to promote the tourist industry in the area. The competition is open to people in the tourist industry and anyone who organises a tourist activity in the department of Ille and Vilaine. The competition takes into account the innovation, originality and quality, of the tourist enterprise. It evaluates the services provided and the welcome that is offered to tourists. It also assesses the accuracy and effectiveness of practices in eco-tourism. It is with great and justified pride that we found that our gite had been selected to participate for the “Tourism Trophy” in recognition of the work that we have accomplished. This selection is a fitting reward for our hard work. 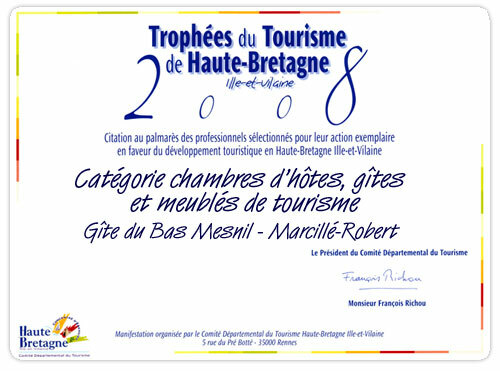 It also reiterates and reinforces the previous awards received “Tourism for the Handicapped” and the “Tourism in the area of Les Portes de Bretagne”.